As the fan base wait for the imminent release of Sonic Mania Adventures, the newest cartoon incarnation of Sonic the Hedgehog, it appears that another cartoon, pitched some 10 years ago, never saw the light of day. According to a LinkedIn profile for TV writer Grant Moran (whose credits include Animaniacs, Tiny Toon Adventures and Batman), a new Sonic the Hedgehog cartoon was in the works between the months of May and October 2007, some 3 years after Sonic X concluded. We contacted Mr Moran, who was kind enough to provide a few more details about the TV series which ultimately failed to get green-lit. Simply entitled ‘Sonic the Hedgehog’, it was initially commissioned by Sega through entertainment company Phuuz Entertainment. Although no further details could be provided, we thank Mr Moran for confirming this was indeed a TV series project, and will bring you any further updates to this story as they come to light. 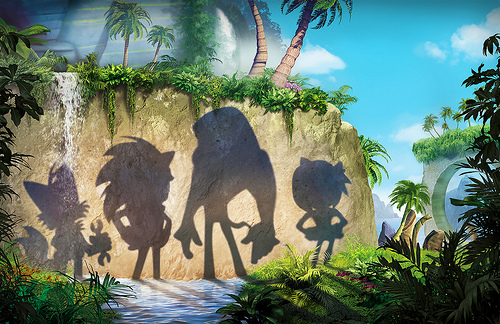 New Sonic Cartoon: “Sonic Boom,” Coming Late 2014! It’s been the subject of rumour for a few months now, it’s been hinted at in a magazine advert. But the rumors can finally be put to and end… It’s real! Sega have announced a new Sonic Cartoon. No I am not kidding! This is real, there is a new Sonic cartoon in the works! Currently going by the working title ‘Sonic Boom,’ the show will debut in the US on Cartoon Network, then on CANAL J and GULLI in France at the end of 2014, with a global rollout to follow. There will be a total of 52 eleven-minute episodes and it will be a co production between SEGA Of America Inc & Genao Productions. Sonic Boom is a character-driven comedy that leaves a trail of robot wreckage in its smoldering wake. The series centers on Sonic, his best friend and sidekick, Tails, their never-ending search for adventure, and their battles with Sonic’s arch-nemesis, Dr. Eggman. Rounding out the ensemble are fan favorites Knuckles and Amy Rose, plus a rogue’s gallery of enemies—some familiar to Sonic fans and some brand-new. SEGA is actively seeking partners in support of the new series launch across a range of industries including broadcast and licensing. This would suggest that Sega are not only looking to expand the TV show into other territories, but also looking to create merchandise around it. You can read the full press release at the Sega blog. Now is the time to be excited. Full press release is as follows. Sonic the Hedgehog, the iconic video game character who has brought his trademark speed and attitude to four TV series and more than 70 video games, is returning to television in his first-ever CG animated series in the fall 2014. The action packed comedy series aimed at children 6-11 will debut first on Cartoon Network in the U.S. and on CANAL J and GULLI in France, with a global rollout to follow. The initial order of 52 eleven-minute episodes is co-produced by SEGA of America Inc. and Genao Productions. Evan Baily, Donna Friedman Meir, and Jane McGregor, Executive Producers for SEGA, packaged the series, bringing together SEGA, Cartoon Network, and Genao Productions. Sandrine Nguyen and Boris Hertzog, Executive Producers for Genao, assembled a world-class lineup of partners in France, including broadcasters GULLI and CANAL J, Lagardere Entertainment Rights and Lagardère Active TV Licensing & New Business. Baily, Meir and Nguyen developed the series, and Hertzog and McGregor structured the financing and negotiated all the deals. Baily (formerly EVP of Production and Creative Affairs for Classic Media) and Co-Executive Producer Bill Freiberger (The Simpsons, Drawn Together) are showrunners. Takashi Iizuka, the head of Sonic Team and driving creative force behind the Sonic games, is overseeing the series to ensure that it’s true to the Sonic characters and universe. “Sonic is the star of the SEGA universe and the stage is now set for him to shine like never before. By teaming up with world-class partners in television animation like Cartoon Network, Genao Productions and GULLI, we’re ensuring that the Sonic legacy will be introduced to a new generation of children across the globe,” said Hiroyuki Miyazaki, SEGA’s Chief Content Officer for Sonic. “We wanted to strengthen our TV channels’ editorial content with strong brands. This is our new objective. Sonic is an enormously popular and unique character with all the qualities of an animation series’ great hero—humor, bravery, loyalty, inventiveness. We are extremely proud to welcome him across our kids and family channels at Lagardère Active and will activate across these channels to raise awareness and excitement for the new series,” said Caroline Cochaux, Head of Programs, Kids & Family Channels, Lagardère Active. “Genao is thrilled to collaborate with SEGA on this amazing project and embark on new adventures with the fastest hedgehog in the world. It is so exciting to work on such a world-class brand,” said Sandrine Nguyen, Managing Director of Genao. “On the New Business & Licensing Side, we are proud and excited to handle the representation of Sonic which counts among the leading characters loved by kids. Thanks to our 360° platform which includes Digital Activities, Magazines, Indoor Parks, Grass Root events, we will push Sonic and the Consumer Products to a new level,” said Benoit Roque, Head of Lagardere Active TV Licensing & New Business. SEGA is actively seeking partners in support of the new series launch across a range of industries including broadcast and licensing. In terms of television and digital distribution, Lagardere Entertainment Rights holds worldwide rights excluding the U.S. and Asia (but including Japan); SEGA Corporation will manage Asia (excluding Japan); Baily, Meir and McGregor will manage the US through McGregor’s company Jane McGregor, Inc. Licensing support will be spearheaded by Lagardère Active TV Licensing & New Business in France and SEGA in all other territories. Sonic the Hedgehog first appeared as a videogame character in June 1991 and instantly became an icon for a generation of gamers. Defined by his super-fast speed and cool attitude, in the years since he first raced on to videogame consoles Sonic has become a true global phenomenon with over 140 million videogames sold or downloaded worldwide across consoles, PC’s, mobile phones and tablets. SEGA’s iconic blue blur has also gone on to enjoy incredible success in many licensed areas, such as toys, apparel, comics and animation. This year SEGA announced an exciting three title exclusive partnership with Nintendo for the Sonic the Hedgehog videogame franchise. The highly anticipated Sonic Lost World™ will be the first title to launch under this agreement and will be available in stores later this year for Wii U™ and Nintendo 3DS™ platforms.